Here is a video on the Curse of Delilah, followed by a Summary. After the Summary are more sections. Under “More Information” is the relevant Biblical passage. Text in green font is not in the video. This is about the Curse of Delilah. It’s a curse used by Black Magicians to drain the manhood from men. And these days, it consists in mind controlling them into plucking their eyebrows … especially, a very effeminate look of plucking the eyebrows. So: The Curse of Delilah. Link: “How to Lift the Dire Karma of the Jackass Love Curse,” by Alice B. Clagett, published on 15 June 2018, https://wp.me/p2Rkym-9qX .. 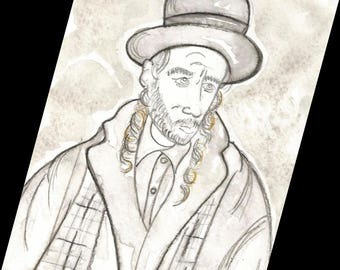 Image: Hasidic Jewish Art, , https://i.etsystatic.com/7622672/r/il/530619/1387489360/il_340x270.1387489360_54gq.jpg .. He then wore the beard, according to the astral lore, while stalking people he intended to murder for thrill. Were this curse true, it would be a way of damning the original person’s Soul, most especially if that person were a Jew or a Sikh, as both these religions prize retaining hair, and amongst men, wearing beards. It’s a form of sacrilege, like the Black Mass, the Black Marriage, and the astral taunting of a person using their sacred name. However, the same curse might be used against anyone at all, whether man or woman, by harnessing their sexual drive, symbolically, to the black magician’s intended murders. Thus the cursed person might be made to live through the black magician’s nefarious deeds, on the astral plane, as they were committed. Of course, the important thing is to learn to recognize sorcerers and black magicians for what they are, and avoid them. Also, to mindfully dispose of one’s own body hair. Also, to do one’s best not to let one’s personal effects fall into the hands of a voodoo person, who might use them for his craft. And then, once such machinations are uncovered, one might begin the work of reparation … of blessing that which has been lost, and blessing that which one has, and relying upon God and the blessed Angel Realm, through prayer and praise, to uplift oneself and one’s home, family, and friends. 4 “And it came to pass afterward, that he loved a woman in the valley of Sorek, whose name was Delilah.5And the lords of the Philistines came up unto her, and said unto her, Entice him, and see wherein his great strength lieth, and by what means we may prevail against him, that we may bind him to afflict him: and we will give thee every one of us eleven hundred pieces of silver. 6And Delilah said to Samson, Tell me, I pray thee, wherein thy great strength lieth, and wherewith thou mightest be bound to afflict thee.7And Samson said unto her, If they bind me with seven green withs that were never dried, then shall I be weak, and be as another man. 8Then the lords of the Philistines brought up to her seven green withs which had not been dried, and she bound him with them. 9Now there were men lying in wait, abiding with her in the chamber. And she said unto him, The Philistines be upon thee, Samson. And he brake the withs, as a thread of tow is broken when it toucheth the fire. So his strength was not known. 10 “And Delilah said unto Samson, Behold, thou hast mocked me, and told me lies: now tell me, I pray thee, wherewith thou mightest be bound. 11And he said unto her, If they bind me fast with new ropes that never were occupied, then shall I be weak, and be as another man. 12Delilah therefore took new ropes, and bound him therewith, and said unto him, The Philistines be upon thee, Samson. And there were liers in wait abiding in the chamber. And he brake them from off his arms like a thread. 13 “And Delilah said unto Samson, Hitherto thou hast mocked me, and told me lies: tell me wherewith thou mightest be bound. And he said unto her, If thou weavest the seven locks of my head with the web. 14And she fastened it with the pin, and said unto him, The Philistines be upon thee, Samson. And he awaked out of his sleep, and went away with the pin of the beam, and with the web. 15 “And she said unto him, How canst thou say, I love thee, when thine heart is not with me? thou hast mocked me these three times, and hast not told me wherein thy great strength lieth. 16And it came to pass, when she pressed him daily with her words, and urged him, so that his soul was vexed unto death;17That he told her all his heart, and said unto her, There hath not come a rasor upon mine head; for I have been a Nazarite unto God from my mother’s womb: if I be shaven, then my strength will go from me, and I shall become weak, and be like any other man. This entry was posted in Bible, Christianity, Curses, Dissolving black magic in the Light, Judaism, Voodoo - donkey man and tagged Bible, black magic, Black Marriage, Black Mass, Christianity, Curse of Delilah, curse of the short hairs, Curses, Hasidic Beard, Jackass love curse, Judaism, sacrilegious curse, Samson and Delilah, strength, strength of hair, weakness on 22 June 2018 by Alice B. Clagett.